Editor's Note: This is the first of a two part series on the straight arm double lapel grab where the attacker grabs the jacket lapel or shirt on both sides, but then holds the defender at arm's length. Part 1 shows a defense to this attack taken from the karate kata Pinan number four. The second article will feature another kata's solution to the same attack. These articles complement an earlier article, "The Double Lapel Grab," which addressed the same grab, but was different in that the attacker there pulled the defender in. You are in the middle of a heated discussion, an argument or other confrontation and suddenly the other person loses control and grabs your shirt on both sides of your chest, or the lapels of your jacket, with both hands. Sometimes the aggressor pulls you in close (the subject of a previous article, "The Double Lapel Grab"), but just as often you are just held at arms length -- a somewhat timid attack to say the least. Of course, you have to be careful of a kick, but this type of attack suggests that the aggressor is either really not sure of what to do, or that he or she has lost control but really doesn't want to get into a full fledged altercation. So, what to do? You have a lot of options. If the attacker doesn't escalate into punching or a follow-up kick, the best initial option is to try to diffuse the situation verbally. While the attack is potentially scary, remember that the attacker is not really hurting you. He or she is also occupying his primary weapons -- the hands. So, if you remain calm, often the attacker can be convinced to dislodge himself from a situation that he or she probably didn't want to escalate in the first place. Of course, you can just relax, do nothing and wait. The attacker just might tire of his or her physical substitute for words and eventually let go. But be attentive to any possible follow-up attack. This assumes, of course, that the two arm grab isn't just being used to immobilize you until a companion can take your head off. In the latter situation, you must react immediately. If you must proceed I always advise to use a "continuum of force" -- starting with techniques which may hurt, sting or create the release itself, but that will do no harm to the aggressor, and progressing through to being able to render the assailant unconscious, incapacitated or immobilized. The second critical factor is that any technique should be effective, easily applied and useful for a weaker person against a stronger one. 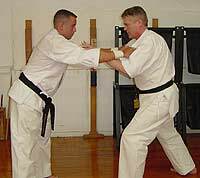 A number years ago while teaching Seido karate at the State University of New York at Buffalo (SUNY) we found that many of the common street self-defenses we taught students either were not very effective, or didn't work well if the defender was much smaller and weaker than the aggressor. When we began examining our karate kata, however, various solutions and progressions of technique began to jump out at us. The more we looked, the more we found. This article will illustrate self-defenses technique against the straight arm double lapel grab taken out of Pinan 4. The next article in this series will provide another solution taken from the kata Seinchin, although as you will see that the two technique series can be linked. If the attacker is larger than the defender, arm's length often means that the defender can't reach far enough to counter with the arms -- they are just two short to reach the head or body. But they can reach far enough to pinch the tender area under the upper arms. While painful, this counter does no real harm and many attackers will just release and jumb back. See: Ouch! The Mighty Little Pinch For Self-defense. Now, pull backward (if his arms are locked this won't pull the attacker inward towards you but will momentarily lock the attacker's arms in place) while executing a front kick. This pull-kick action greatly magnifies the power in the technique. Kicking targets are many -- the groin, lower abdomen, or solar plexus. The target shown here is a favorite of Itosu, the kata's creator: the side (right) of the opponent's lower abdomen at the crease of the upper leg. (4) Here I use the big toe of my foot as the striking weapon. If you have not trained in straight toe kicks use the ball of you foot. On the street the toe of the shoe would be used and the kick driven inward. The area between the upper leg and lower abdomen (in the middle of the crease between the two) is very sensitive and not well protected by thick muscles. It is here that the femoral nerve, a major nerve of the leg, and femoral artery run together and are exposed to attack. A driving kick will force the attacker's hip backward (and head forward) while causing a lot of pain (the body's reflexive action to this strike is to withdraw). In most cases the attacker will try to lower his arms to defend against the kick, but this will be momentarily blocked (or slowed) by the defenders hold on the arms. Here, I have let go with my left arm just after the kick has landed. Notice how close it is to the attacker's head. In Pinan 4, the next move is to withdraw the right hand while punching to the middle with the left. (5) The photo above shows this action from the opposite side. The defender can thus easily punch with the left fist while simultaneously pulling in the right arm, still holding the opponent's forearm - something that holds the attacker in place while punching. (6) The next move in the kata -- a right punch of a left/right combo is not shown). Of course, if the attacker doesn't let go of his grip, you can kick again, and again. 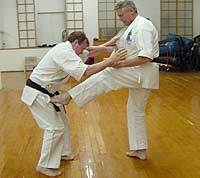 In this self-defense the primary technique is the holding of the arms and the kick. The follow-up punches are secondary. They can also vary. If the attacker doesn't let go the defender can kick again, or if one arm is let go (as demonstrated above) the follow up technique can be a punch. If both attacking arms are withdrawn the defender can punch, or an elbow or other technique can be used. People react differently, thus when practicing techniques from a kata pay greatest attention to the primary technique in any sequence. Also practice alternative follow-up techniques based on differences in possible reactions. Many follow-up techniques also contain a number of possible applications, one or more of which can be used when the attacker reacts in such a way as a technique can be effective. You can also move naturally into a second self-defense method, as is illustrated within Seinchin kata. This is the subject of the next article, "The Straight Arm Double Lapel Grab, Part 2." (1) Actually this sequence is not exactly the same although most perceive it to be so. Each is a slightly different responses to a slightly different attack. The first move in this sequence (after turning 180 degrees) is against a two arm open hand push (to be addressed in another article) and the second is against a straight arm double lapel grab. 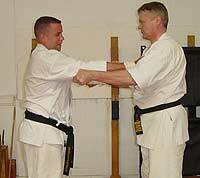 A different sequence later in the kata is a response to a two hand, pull-in lapel grab, addressed in a previous article. 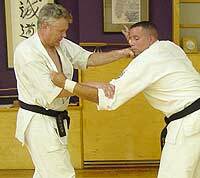 (2) I have been shown (by one Okinawan teacher) that crossing the arms in the beginning of this move is actually a strike to the inside of the attacker's lower forearms. The target is a variety of nerves that not only will cause pain, but also weaken the hand grip. While sometimes effective, I believe this technique can usually be performed just as effectively without utilizing this pressure point movement. If you do use it, however, the striking surface is the top outside of the little finger knuckle, with the right hand knuckle hitting across to the inside of the attacker's right wrist and the opposite with the other hand. The knuckles strike (about a hand width above the wrist crease) in and up, hitting a variety of nerve targets in the area including the median nerve (that lies somewhat deep below the surface) that runs along the middle of the forearm down into the wrist as well as superficial branches of the radial nerve that lie along and under the radius bone (thumb side of the arm). Striking these targets can cause severe pain, numb the arm and affect motor (nerve) control of the fingers (loosening the grip). (3) In the kata the hands are usually closed, but in some old renditions the hands are open, and it is known that Itosu, the creator of the kata (modified from earlier versions known as Channan) closed the hands on many techniques practiced within the Pinan series. So opening the hands can be seen as a somewhat hidden application of the move. See the FightingArts.com articles: "Channan: The “Lost” Kata of Itosu?" and "Examining Yasutsune Itosu." (4) Here Itosu, the creator of the kata, would have executed the kick with a straightened big toe. Toe kicks were a favorite of early Okinawan karate practitioners. Just as western ballet students learn to balance on their toes, Okinawan karate students trained from childhood to condition and build up strength in their big toes - often using exercises to stand up on them and use the toes to strike harder and harder targets. Itosu was famous for his "Low 9 Target Toe Kicks" (a subject of a future article), which students were drilled in repeatedly. In another old Okinawan foot techniques the toes were balled, much like the fingers are in a typical karate punch. This method had to be trained from early childhood since age quickly stiffens the toes and joints of the foot. (5) The photo illustrating this hold and punch is not as pretty as the long, low stance and punch performed in the kata. Remember, however, that kata illustrates movement and direction. The length and depth of movement, however, often changes with circumstance. Also, what happens between the beginning and the end of a technique, is the most important. 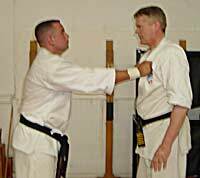 Most students, however, focus on the beginning and end positions of each kata move. Think how it would be if we tried to learn tennis by only looking at the start of the swing and the swing's finish. You wouldn't learn very much that way, but that is exactly what most people do when trying to understand kata. (6) Here I would personally use an open palm heel to the side of the jaw or cheekbone rather than use a fist. This is an effective option. As the strike lands pivot the palm forward, fingers rotating downward. Christopher Caile is the Founder and Editor-In-Chief of FightingArts.com. He has been a student of the martial arts for over 43 years and holds a 6th degree black belt in Seido Karate and has experience in judo, aikido, diato-ryu, boxing and several Chinese fighting arts. He is also a long-term student of one branch of Traditional Chinese Medicine, Qigong. He is a personal disciple of the qi gong master and teacher of acupuncture Dr. Zaiwen Shen (M.D., Ph.D.) and is Vice-President of the DS International Chi Medicine Association.